As most of us eventually do, I recently found the need to get a letter opener to combat the endless paperwork that ends up on my desk. But what is the fun in just purchasing a generic letter opener? I decided to have some fun with my little endeavor, and came up with the idea of bringing the Daedric Sword from Skyrim to life. In addition, I made 2 separate wall mounted holders (both covered in this Instructable!) so I could display my letter opener on a mantelpiece. In this Instructable, I will walk you through the hard task of researching, designing, cutting, carving, gluing, and painting a fully wooden letter opener from scratch. When trying to bring a prop from a video game to life, one needs to study the source material. I went to Google and found a bunch of reference images for the "Daedric Sword from Skyrim" - namely this and this if you want to take a look at some nice images. It turns out that making a sword designed to look cool in a virtual environment isn't always the most practical, especially if you want it to end up as a letter opener. I ended up altering the design to be better suited for its new purpose - namely, having a larger handle in proportion to the rest of the sword, having a shorter blade, and taking away the spikes / serrations (I know, I know, but you probably want to leave your letter in one piece). I drew up some concept designs in Illustrator. I used these as a reference for when I was making the sword, so I attached them if anyone wants to try to replicate my project. The first diagram is a cutting diagram, to help figure out how to cut various pieces of balsa. A piece will be marked with "x2" to indicate that there are 2 of these parts - one on the top, one on the bottom - to give the sword a 3D effect. The second diagram is a painting diagram, to help you figure out which colors to paint the sword. 1) Wood - Balsa wood is great for making small crafts, and is easy to manipulate (unlike heavier woods, which might require tools most people don't have). Various sizes used throughout Instructable. 2) Cutting Tool - You need either an Xacto knife or a razor saw to cut your balsa. Xacto knives are great for the small details of a sword, but a razor saw can be helpful when an Xacto knife just isn't strong enough. 3) Super Glue - Super glue is used to join the pieces together. 4) Sand Paper - You need rough sandpaper for getting the general shape of the sword and fine sandpaper for the detail work. 5) Paint - Swords aren't made out of wood, as anyone knows. However, the right paint can surely make up for it. I used a white primer, a dark gray for the hilt, a silvery shiny gray for the sword blade, and red for some outlines. 6) Hot Glue - I used hot glue to fill in some of the crevices that arose when building and later painted over it. You also need a hot glue gun. See the pictures above for the exact products I used. Feel free to make any needed substitutions. If you take a look at the daedric sword, you will notice that the hilt curves slightly. For the purpose of aesthetic appeal, I decided to increase the amount of curve. I also divided the hilt into 5 parts and joined them with smaller bits of wood, because for some reason the "actual" sword has notches along the hilt. Take a piece of 3/4 x 3/4 x ~5 in. wood and round the 4 long edges using sandpaper. This piece of wood will then be cut up to make the 5 segments. Cut 5 pieces of wood 3/4 x 3/4 x 1/2 in. from the piece of wood we just rounded. These segments get larger as you go up the hilt, starting at 3/4 x 3/4 x 1/2 in. and slowly increasing to 3/4 x 3/4 x 3/4 in. Angle the cuts as seen in the picture to curve the hilt. Then cut 4 pieces of wood 1/2 x 1/2 x 1/6 in. These will be the joints. Join the pieces of the hilt together, alternating between segments and joints. Start off by printing out the diagrams provided if you need to trace the pieces to figure out the shape. Then cut out the 3 main pieces of the pommel, as seen in the first image. Glue the two smaller pieces on either side of the larger one. When done it should look like the second image. Finally, you need to cut out 2 rectangles to help bridge the gap between grip and pommel. You also need a smaller, trapezoidal piece that will go in between the two. The pieces are shown in image three and are put together in image four. Finally, glue the pommel to the base of the grip. The shorter edge of the pommel should be facing inward, and the larger one should be jutting outward. Sand the pommel so that it has curves rather than extrusions. Use the printouts you made in the last step to trace the 3 parts of the blade (first and second images) on pieces of balsa so you can easily cut them out. Start off by cutting out the larger blade. Then, cut the 2 smaller blades and glue them on either side of the larger one at an angle. Sand the edges so that they both narrow to a point. Make sure that the base of the blade is flat, so you can glue it to the hilt. The guard is the most complicated part of the wood cutting. There are 6 pieces necessary for this job. First off, cut out 2 ovals and a rectangle, as seen in the first photo. Glue the two ovals at an angle on the rectangle. Then cut out 2 smaller rectangles (not shown) and glue those centered on the main rectangle, to thicken this part of the guard. Glue it onto the grip. Then, cut out the 3 curving pieces (1 in the first pic, 2 in the second). Similar to the pommel, glue the 2 smaller ones onto the larger curving piece on either side to help it resist against breakage. Glue this on the grip. Sand the edges of all of the pieces to get a better 3D effect. Confusing? As they say, a picture is worth a thousand words - the 3rd photo of this step will greatly help you visualize the guard in relation to the blade and the grip. Now lightly sand the sword, making sure to round off any corners and edges. This will add the finishing touches to the blade. Earlier when we were making this sword, you might have noticed that we had some gaps between some of the parts, i.e. the blade. You can easily fix this with hot glue. Simply fill all of the gaps with hot glue and sand off the excess bits. Now, this is where I went wrong with my sword. I rushed the hot glue step, thinking that it would be okay if it wasn't perfect because the paint would cover it up. As it turns out, the hot glue is still visible on my blade if you look closely. Try putting on extra hot glue and sanding off the excess, rather than having too little and ending up with a bumpy blade. First off, we need a white primer coat. This is required because balsa will easily soak up an entire layer of paint if you aren't careful. I painted the entirety of the hilt (pommel, grip, and guard) a shiny, smooth gray finish. I then painted both of the blades of the sword a very shiny silver. The silver still let the grains of the balsa show through, unlike the gray finish, which I thought was a nice touch. If you look at reference images, you see how the smaller blade off to the side of the main blade is more of an extension of the hilt. As such, I painted it gray and blended it with the silver where they met. I added the red accents very carefully. The accents kind of look like the frame of the sword - you will find them running along most of the parts of the hilt. I also added additional red accents to the grip, in between the larger pieces. Go back and reference the painting diagram for the blade if you have trouble. 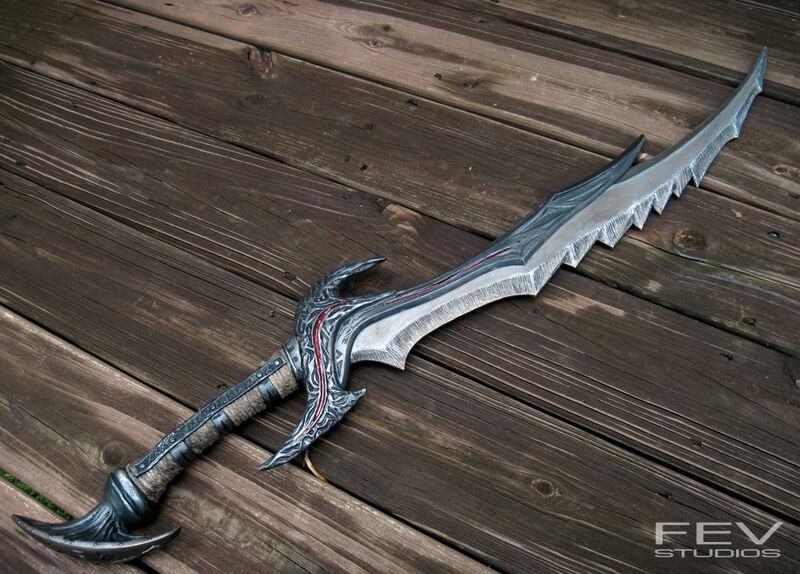 Also check out the above photos of the finished blade to get an idea of how the paint job should look in real life. To make the wall mount holder, I used Illustrator to design the holder to hold the daedric sword as well as possible. Two of the images above represent this process - one is the holder by itself, one is with it holding the daedric sword. I replicated this concept by cutting out 3 sticks of balsa so that they fit together to form a triangle, and then using 4 balsa "prongs" (sticks) to actually hold the sword. If you would like to take a look at the original file, it is in AI form below. To put it simply, I didn't really like the original wall mounted holder. Sure, it turned out great, but when you actually put it to use? I felt that it was too much of a distraction - I should have either gone all out with the holder and made it larger and better, or made it more subtle by just using a push pin (as seen in one of the introduction photos). It also just didn't hold the sword well. I did the measurements based on the size of the sword before painting, and after 3-4 coats of paint the sword had "changed" in size. I decided to make a holder that would be displayed, say, above a mantelpiece or on a door. I made a new holder (next step) that would allow the sword to easily slide in and out without risk of falling. I knew a 2D model wouldn't adequately represent something that is better seen in 3D, so I made a 3D model (below) of it instead. The basic principle behind this new wall mounted holder is that there is a main backing and 2 angled sides. The angled sides are on the top and bottom, allowing the sword to slide in from the side, while keeping it from falling out (because of the angle, which prevents the sword from moving forward). The backing was cut out of balsa to a size of 13 1/2 x 5 x 1/4 in. The two sides were cut to a size of 13 1/2 x 1 1/2 x 1/8 in. I then sanded the 2 long edges of the backing at an angle and glued on the sides. Balsa looks great, but I wanted to have a more professional looking appearance. After my last experience using wood stain on balsa, I decided to paint it brown instead. First, coat the holder in a white primer. Then paint the holder brown. I ended up doing 3 coats of this, but it looked decent after 1 coat. Depending on which paint you use and how much of it you apply, you might need more or less than I did. The last 2 pics show the finished sword on both of the painted holders. I would recommend making both and then making a decision on which one you like best. Overall, I really enjoyed the process of making this letter opener and am sure I'll use it for years to come. If you like this Instructable, I encourage you to try to make it too. If you have any questions about the design process (such as my use of Illustrator), about the specific materials I used, etc. feel free to ask me below. One quick warning - this letter opener was designed to be used as such. If you are thinking of using this as a prop, make sure to check any rules governing props before taking it to any convention (or really, any place in general) and make sure it can't possibly be confused as a real weapon. Since this letter opener is made of wood and not foam, I would highly recommend only using this letter opener as a letter opener. No project would be complete without some nice glamour shots. I took a bunch of shots in various settings, seen in both the intro and in the finish (above). Thanks for reading! I hope you enjoyed this instructable.